which message are you listening to? Have you seen the two videos below produced by Dove? I showed one of them yesterday before my sermon and the second was a bit too risque to show with some younger folks in our midst. My sermon yesterday was part of a series of sermons on Relationships (through April 2010) and the focus for this talk was on Self Identity. Rather than allowing truths of God to inform and transform our lives (Psalm 139), we can fall prey to the messages of the world around us that often convey to us that we simply not _________ enough. I think for me, I wrestle with, “Am I successful enough?” – as a man and ironically, as a christian and especially as a pastor.” It’s not that achievement, pursuits, and “success” are inherently negative or bad…but it’s the occasion when I allow these things to supersede the primacy of my identity coming from my identity as a child of God. These “commercials” are powerful…even despite the appropriate criticisms of Dove that are part of the same company (Unilever) that produces the AXE commercials. Next what are we exactly standing up for when we stand for christmas? I love these videos. They get right to the point and show exactly what the “beauty” industry is about. I would agree with the criticism of hypocrisy, but for any business to create videos that critique or criticize their own industry, that is a very bold step. You have to start somewhere. It is fairly common for me to think about how I am not as good of a husband as I should be, or father, or son, brother, employee, and most definately not as good of a follower of Christ as I should. In the spectrum of how we have the Image of God in us, and how we have fallen, and I know that we are both, but I have to admit I feel more fallen most of the time rather that in the Image of God. As a youthworker I’ve been following Dove’s campaign for some time now and applaud their efforts. I also question the underlying motivation when considering that the Axe campaign is also a part of the same corporate entity. I think a healthy skepticism is important – after all, these are companies trying to make money. It’s laudable that Dove has chosen the high road, but how long will these high ideals continue to be maintained if profits slip significantly? I don’t worry if I’m beautiful enough. I already know that I’m not beautiful enough. It’s not just the media – family and classmates have told me that for a large part of my life, including my own dad. Does God love me? At this point in time, I honestly don’t know… No amount of “You’re fearfully and wonderfully made” can change the way most people look at me. No amount of prayer, or Bible verses, or mantras can change the way I look. I used to be in a college ministry that acted a lot like high school. Even in the Church, guys still focused mainly on looks, and I got pushed to the side while my acquaintances got married. I give up altogether. Looks are paramount, no matter how people try to dress it down with “inner beauty” and “God’s love”. Just my experience, though. Um, no, it’s not just your experience. It’s mine too. I don’t have any answers. I don’t know why I look the way I do. It’s my experience that it is no different in a church setting. Sometimes it makes me angry at God. You wouldn’t believe some of the conversations (if they are one sided can they still be called conversation? As I’ve yet to hear a response) I’ve had with God. Like you, I find myself giving up. But somehow, I think there must be a reason. That’s on a good day. A few nights ago, I was sitting in a prayer group with a woman who did not fit typical beauty standards at all. When I prayed for her, I suddenly felt tremendous beauty in my heart. I told her, “God wants you to know that you’re beautiful, and that you bring beauty with you wherever you go.” And God meant that she was physically beautiful. I could actually see the beauty in her face being born. I would bet that in the past, people had told her she was unattractive, and she’d claimed that for herself when it wasn’t true. As believers in Christ, you two are beautiful. Beautiful on the inside, beautiful on the outside. Most definitely. I’m sorry to say this, but if other people have told you otherwise, they are looking through the lens of their own appearance issues. I know those feelings, of thinking that you could never be beautiful. And I also know what it means to have people call out the beauty in us, as M.E. did for that woman. It has taken years of prayer, times with God’s Spirit spekaing to me, either directly or through His people, for me to even begin to believe that I might be beautiful. I still struggle with accepting compliments. I’m grateful that my husband is diligent in calling out my beauty that I can’t always see or believe. It’s a reminder to be sincere and diligent in our building up of each other in the church. I’ll tell you though, for all the guys reading this, to have good Christian brothers and friends affirm a woman for both her physical and spiritual beauty goes a long way towards healing the wounds. Oh how I want to love the Dove videos. What happens when the Dove woman and the Axe man get together? I’d be MUCH MUCH more impressed if the same message in the Dove ads was given to men – that a woman’s beauty is not just about looks (and your worth is not based on her beauty.) But as it is, they’re just trying to sell products by giving whatever message they have to. Great points, Jennifer – what will it matter to young ladies what Dove says if what guys are telling them is something completely different? Most guys (other than the occasional neanderthal) are too polite to overtly malign a girl for her looks; they tend to do so in much more subtle ways. In my experience women are much more vicious with each other (see sorority hazing as an example). right, they are both owned by Unilever and i mentioned that on my blogpost. i’m glad that Dove has gotten some good solid pushback on the AXE ads. they are pretty over the top. There is something in the Dove ads that feels even more over the top though. I feel like they co-opt a really good message. They aren’t primarily concerned with the good of girls/women – if they were the Axe ads woudlnt exist. They’re manipulating women into buying their product through some very sophisticated measures and that feels worse than Axe doing it through common place measures. Jennifer, your comments are really incisive. Thanks for making me think harder about the ads. Sadly, I think you’re also right. The divergence of products and their correlating messages strongly suggests that it’s not some fundamental commitment on the part of unilever to redefine beauty, but each division’s best effort to maximize their products. great and unfortunate example of the right hand and left hand being out of sync. way out of sync. I have the same struggle. We have to keep in mind that Unilever is huge and without knowing the intricacies of their organizations, it is quite possible that the Axe people don’t know the Dove people at all. Not to say that given the different market segments of the two products, that they would’ve coordinated their messages. As well, most of the self esteem marketing targeted UK and Canada, not so much the US. Other Dove campaigns also started in Europe and eventually find their way to the US. So I guess while you don’t have to fully love the videos, don’t be so quick to dismiss them. While over the top, they remind us that the beauty industry (and even fitness magazines out there…remember Kelly Clarkson’s image on Self over the summer?) will alter images to make their products sell better. The other night my 2 1/2 year old daughter spent the night at her grandparents. Just five minutes after putting her to bed, in her pajamas and diaper, she appeared in their living room completely naked and declared “I want to be naked.” My daughter makes me laugh! But that got me thinking about how as we grow up we so quickly become insecure in our own skin that we find ways to change it or cover it up. I am definitely guilty of those insecurities. 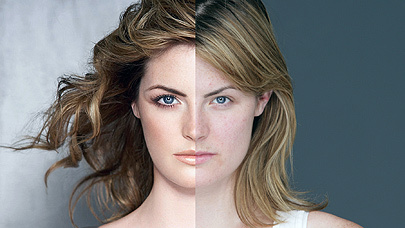 I’m sure marketing does not help those insecurities but I dont believe it is the root cause. PE, I had a really hard week last week that had a lot to do with how I view myself and how others view me. Between the women’s worship on Saturday and your sermon yesterday, God is really trying to get through to me. terri: thanks for the comment. something interesting happened yesterday when i was preaching. i’ll send you a direct note later. It’s secular but soo crucial to helping us find our identity as children of God and not of society. I was called a Beauty (with capital B) when I was young, but I never believed it. Now, as I will be 50 in a few weeks, despite wrinkles, I feel really beautiful, why? God healed me and my beauty comes from inside out. Amazing that the neck and eyes can be changed using the computer. Pictures don’t always tell the truth. That same daughter became very self-conscious as a teen and physically folded in on herself, as if she were trying to hide her figure and her face. I didn’t think she looked any less beautiful than she did at 6, but suddenly she needed more than my unconditional approval. She needed to feel accepted by the larger world as well, and it was all too clear that she didn’t match the fashionable images that she saw all around her. As a young adult she is now beginning to come back out of her shell and reclaim a little of her spunky confidence, but she still seems vaguely uncomfortable in her own skin. My own struggle, ironically, is with the message that good parenting will produce perfectly well-adjusted and successful kids. I know that God gives me the freedom to wrestle with life and make my own mistakes, but nevertheless I worry that my kids’ wrestling is somehow the result of my inadequate parenting. I learned today that they also have a brand called “Fair and Lovely” – a skin lightening cream marketed to darker skinned woman outside of the US. I just cant get on the Dove “film” (aka advertisement) bandwagon. I’m not sure I love the ads, but I’m not so sure I can be critical of them. There’s one thing I’ve learned about marketing: their job is a to judge what direction society is headed (yes, and they also influence it). I find good marketers to be highly adept cultural critics. They see what others don’t and decide how to influence it. I may not approve of their reasons or goals, but I do think we could learn a few things from them. So, for me, I have to give the marketers credit for seeing what direction we’re headed and supporting it instead of suppressing it. Frankly, I’d rather they were making money off this message than another.